Caleb Hudson is the newest member of the Canadian Brass, having graduated from the Juilliard School with both a Bachelor and Master of Music degree. Acclaimed by the New York Times as “brilliantly stylish,” Caleb made his solo debut with the Chamber Music Society of Lincoln Center, performing Bach’s Brandenburg Concerto No. 2. 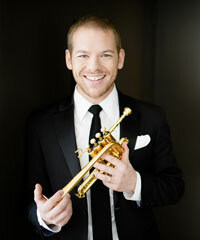 Hudson has performed as a soloist around the world, most recently with the Israel Philharmonic in Tel Aviv. Possessing a wide range of musical styles, his experience ranges from soloing in Carnegie Hall to appearing with rock band Vampire Weekend on Jimmy Kimmel Live. Other recent solo engagements include the Santa Fe Chamber Music Festival, Yellow Barn Festival, University of Georgia Wind Ensemble, University of Scranton and a solo recital at the University of Georgia that was broadcast nationally on NPR’s Performance Today. Hudson won first place at the National Trumpet Competition multiple times, and performed with pianist Vladimir Feltsman at the Aspen Music Festival, as well as the New York City Ballet, New World Symphony, Jupiter Symphony Chamber Players and New York Trumpet Ensemble. An avid baroque musician, Hudson also performs with notable early music ensembles including Philharmonia Baroque, American Bach Soloists, The American Classical Orchestra, Concert Royal and the Trinity Baroque Orchestra. He is an alumnus of Interlochen Arts Academy and Ensemble ACJW, a fellowship program of Carnegie Hall that promotes arts advocacy, community outreach and music education. In addition to performing in Canadian Brass all year for thousands of fans around the world, Hudson has a passion for writing music, especially for the group. His arrangements and compositions have been published and featured on two albums, Canadian Brass: Perfect Landing and Canadian Brass: Great Wall of China. In 2015, his original composition White Rose Elegy was performed as a world premiere in the Lincoln Center by the Canadian Brass and New York Philharmonic Principal Brass and Percussion.